The earliest record found of the Mill is a lease from 1327, which refers to “Homesbogh alias Hornysbowe” This credits Hornsbury as being one of the earliest in the area, but it is believed that the oldest part of the existing building only dates back to 1835. Between 1835 and 1967 Hornsbury Mill and Hornsbury Farm were owned by the Buckland family who milled here until 1885 when Thomas Scutt moved in as owner/occupier until his death in 1902. The Chaffey family then took over and continued to work the mill commercially until 1942. Mr George Chaffey died in 1967 when the mill and farm were sold as two separate properties. 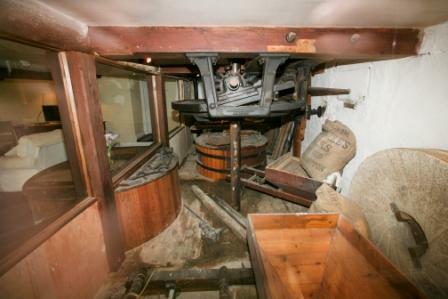 In 1973 Hornsbury Mill was converted and opened to the public as a museum by the Crossman family. In the course of the conversion the Crossmans found several names and dates carved into the beams or pencilled onto the walls and woodwork and these can still be viewed today in some of the hotel bedrooms. 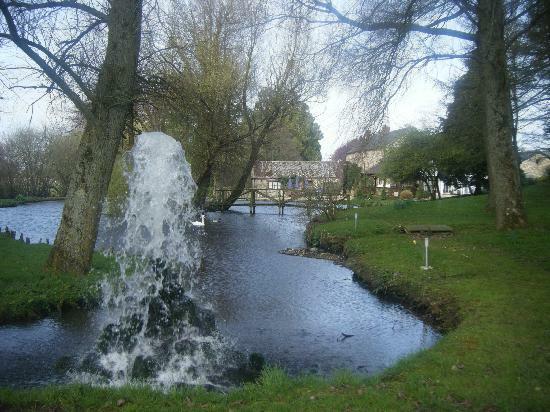 Hornsbury Mill is now an established 4* hotel and restaurant providing a beautiful setting for weddings and functions. Careful and sympathetic conversion and refurbishment means that many of the original elements of the old mill remain making it a fascinating venue, full of charm and character. The main wheel is located in the centre of the mill building and can be viewed from the exterior of the property as well as through a glass partition from the hotel’s restaurant. It is an overshot wheel measuring 18ft in diameter, is 6ft wide and weighs 4 tons. It has a 15ft main axle and 48 buckets each holding 20 gallons. 1500 gallons of water can flow over the wheel every minute. The wheel bears the makers name ‘Bodley Bros. Engineers, Exeter’ and also the name Joseph Hawker, Chard (Millwright) who probably designed and installed the existing machinery during 1870s. The Wallower Wheel measuring a mere 10ft in diameter can be viewed through the viewing panel in the lounge area of the hotel. The Crown Wheel lends its name to our beautiful Crown Wheel Suite, also used as the bridal suite. The turning wheels and cogs of the crown wheel mechanism can be seen from the lounge area when the water wheel is in motion. This 9ft diameter horizontal wheel provides the drive for the mill stones and ground the corn in days gone by. Several old mill stones and tools of the trade are still on display here. The long man-made leat brings water to the power the wheel. It is diverted from the river some three quarters of a mile upstream at a sluice gate. The water travels along the top of a bank into the wheel house at the back of the building, it passes over the turning waterwheel then out into the stream in front of the hotel where it continues its journey by rejoining the River Isle.